What does my car starter look like? Well your car would not turn over and you just had your battery replaced last month. You have your car towed into the shop and you get a ride to work from a family member or friend. You get a phone call from the shop it was towed to and sure enough you have a bad starter. You are given an estimate for diagnoses and repair and you give them the okay to go ahead and fix your car. 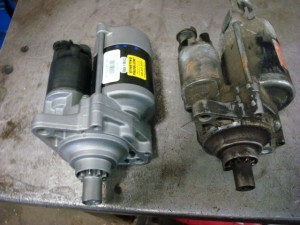 In this post I am showing you a picture of two starters, new one on the left, old one on the right. I suggest that any time you get a part replaced ask for the old part back, or to at least see it. One of the main reasons I suggest that you ask for your old starter back is this. In some cases a starter can be fixed by replacing the starter contacts only, and you could be told that your starter was replaced. ( See my post from 1/22/2013 for more information) Maybe you have had the same mechanic for years and you wont have to ask for your old part back because you trust him. One thing you have to keep in mind that if you have a starter or alternator replaced there will likely be a core charge involved. What is a core charge? Lets say for example you were replacing your own starter in your driveway at home. You went to your local parts store and paid $275.00 for the starter, and there was a $75.00 core charge with it. After you replaced your starter in your driveway you would take your old starter put it in the box that the new one came in and bring it back to the parts store. You should then get $75.00 back from the core charge to put in your pocket.Then your old starter will likely be sent out to be rebuilt to a re-manufacturer. So with that said you may want to ask your mechanic how they handle that. Do they discount you the core charge amount off the price of the starter,or do they keep it? So if you did not know what a car starter looked like before you read this, hopefully this will help you if your vehicles starter fails and you ask to see your old part. New starter on left, old starter on right. « Judy R. Says: I had my front brake’s replaced,now my car pulls right when I brake.Whats wrong?